After Mark Stone was traded to the Vegas Golden Knights just minutes before the February 25th trade deadline, he admitted to have already worked out an extension with the team. That extension was to be for eight years and $76MM, but couldn’t be officially filed until March 1st because of the “tagging” issue of having more than the salary cap ceiling already committed to the next season. Then March 1st came and went with no extension, leading some to wonder if something had occurred to stop the deal from coming together. Not to worry Golden Knights fans, as Renaud Lavoie of TVA Sports reports that the only reason the deal isn’t done was a personal issue that kept GM George McPhee out of town. Lavoie notes that McPhee wanted to be there in person, and that the deal will be filed in the next few days. Stone hasn’t been able to score much for the Golden Knights so far, recording just one assist in his four games for the club, but that hasn’t stopped him from making an impact. The former Ottawa Senators forward has attempted 23 shots so far, getting 13 of them on net. That kind of volume is sure to garner some results in the near future, even if Stone is playing fewer minutes than he has the last few seasons. 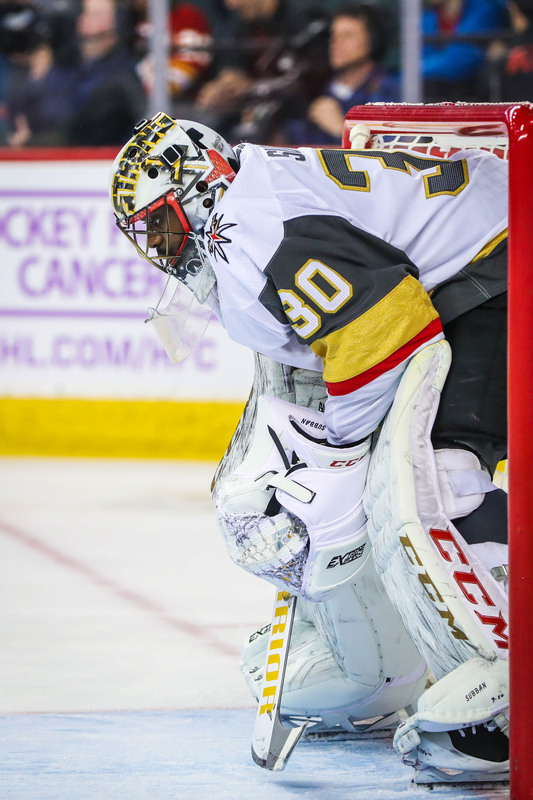 Vegas takes on the Calgary Flames tonight in a battle of Western Conference titans, a matchup that would be a perfect time for Stone to break out and tally his first goal as a Golden Knight. The Edmonton Oilers find themselves without a captain to lead the ship at the moment, instead handing off daily GM duties to the rest of the front office including Keith Gretzky and CEO Bob Nicholson himself. Firing Peter Chiarelli was a move many saw coming from a mile away, but it now leaves Edmonton in a midseason search for his replacement. Hockey insider Pierre LeBrun spoke to TSN’s Ryan Rishaug about who might be of interest to the Oilers management group, and Kelly McCrimmon’s name came up once again. McCrimmon, currently the assistant GM of the Vegas Golden Knights, is a rising star in the NHL. After spending 28 years with the Brandon Wheat Kings of the WHL as owner, GM and coach for various periods, McCrimmon joined George McPhee to build a winner right from day one in Vegas. He did just that, helping craft an expansion draft strategy that saw the Golden Knights put together a team that took them all the way to the Stanley Cup Finals in their first year as an organization. That obviously turned some heads, but it’s tough to believe at this point that the Golden Knights would let him walk out the door in an unfinished second season. LeBrun notes that McPhee previously told him that he would not stand in McCrimmon’s way, but that was in response to an inquiry about the opportunity that the new Seattle franchise might bring. In fact, LeBrun states that McCrimmon is indeed on Seattle’s short list for potential general managers though that process is still in its infancy. Edmonton obviously has a little more urgency, but there are obstacles in the way. First and foremost is that the Golden Knights and Oilers are in the same division, fighting for the same playoff spots. Vegas sits 13 points ahead of the Oilers in the Pacific Division, but the two teams will battle twice more in the second half this season. They also aren’t scheduled to be split up anytime soon, given that the Seattle team is meant to push the Arizona Coyotes out of the Pacific when they enter the league. It’s going to be hard for McPhee to watch his right-hand man go to a division rival, and even harder to see it happen during the season. When Nate Schmidt was recently suspended for 20 games for violating the league’s Performance Enhancing Substance policy, the Vegas Golden Knights immediately came out in support of their defenseman, stating that they “strongly disagree” with the ruling. Schmidt himself stated that he believes the positive test came about through environmental contamination instead of any substance he ingested, given the minuscule amount that was found and the lack of any evidence in a hair sample. Today, Vegas GM George McPhee didn’t go so far as blame Schmidt but did defend his organization and the Golden Knights’ training staff, telling reporters including Ken Boehlke of SinBin.vegas that the substance “didn’t come from us.” While Schmidt claimed that the only supplements he used were from the Golden Knights, McPhee explains that a simple protein shake could cause a positive test and that he has told other players that they “don’t need anything from anywhere else.” Schmidt is practicing in unofficial skates with other players from the team, but will miss the first 20 games of the regular season and is not allowed to play in any preseason contests. McPhee also spoke about the still unsigned Shea Theodore, and told reporters that he hopes a deal will be completed soon. Theodore is one of 11 remaining restricted free agents without a contract, and could potentially miss part of training camp if he doesn’t have a new deal in the next week. The young defenseman is even more important for the Golden Knights now that Schmidt will miss a quarter of the season, and could be asked to log huge minutes in the early part of the year. Coming off his entry-level contract, the Golden Knights have a decision to make between signing him to a bridge deal on a lower cap hit or trying to lock up the 23-year old long-term before he really shows his full potential. Richard Panik was arrested earlier in the offseason for trespassing at an Arizona establishment, and pleaded guilty in court this week. Craig Morgan of The Athletic passes along a statement from the Coyotes, which says they have dealt with the situation internally and won’t comment further. TMZ has released a video of the arrest, but even with the added publicity it seems as though the Coyotes will not hand out any punishment that includes a suspension. In the early part of the 2017-18 season, one of the biggest stories in the NHL was that of Vadim Shipachyov. The Vegas Golden Knights had convinced the then 30-year old Shipachyov to leave the KHL after nine seasons in the league and come to North America to play in the NHL. Signing him to a two-year, $9MM contract before the expansion draft process or free agency, the Golden Knights were betting big on the talented Russian forward. Unfortunately that relationship didn’t get off to a good start, with Shipachyov beginning the season in the minor leagues and failing to really ever establish himself with the Golden Knights. After just three NHL games, the two sides parted ways and Shipachyov returned nearly all of his $2MM signing bonus in order to return to Russia. Some noted that the tough situation might prevent the Golden Knights from convincing other Russian free agents—including Nikita Gusev, whose rights belong to Vegas—from joining their organization in the future, though there was never any real evidence to support it. Now, Igor Eronko of Sport-Express passes on a Russian report that Golden Knights GM George McPhee recently had a meeting with Vladimir Tkachyov, whose contract is scheduled to expire next spring. Tkachyov—the 24-year old center playing for Ak Bars Kazan—was linked to teams like the New Jersey Devils, Toronto Maple Leafs and Edmonton Oilers back in 2017 before signing a two-year extension with Ak Bars. That was followed by his best offensive season yet, in which he scored 22 goals and 36 points in 53 games and helped his club win a Gagarin Cup. There’s no reason for NHL teams to have lost interest, but it’s not clear who is the front runner for his services at this point, or even if he’ll consider coming to North America this time around. The Golden Knights obviously have a lot to offer, given their immediate success in the NHL and healthy salary situation. If they are interested in signing Tkachyov though, it will be interesting to see how the previous Shipachyov situation affects things—if it does at all.